On April 16th, I joined 13,000 other cyclists in riding The BP MS150, the largest charity bike ride in North America, which raised a record $20.3 million this year toward the research and treatment of Multiple Sclerosis. What should have been a 150-mile ride over two days was shortened due to an incredibly intense, one day, 83-mile ride due to record rains and flooding in Texas. 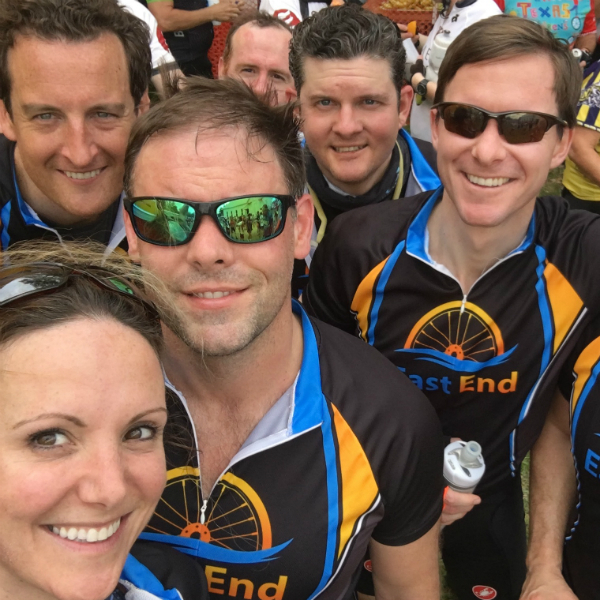 I met our team captain through an Amagansett share house – so we just had to name the team “East End.” He has participated in the ride since 2009, just after someone he knew personally was diagnosed with MS. My husband rode with him twice in past years, and I was always inspired by them and curious to see how I'd measure up. Last year, I learned that a very close friend of mine also has MS and this motivated me to finally accept the MS150 challenge. 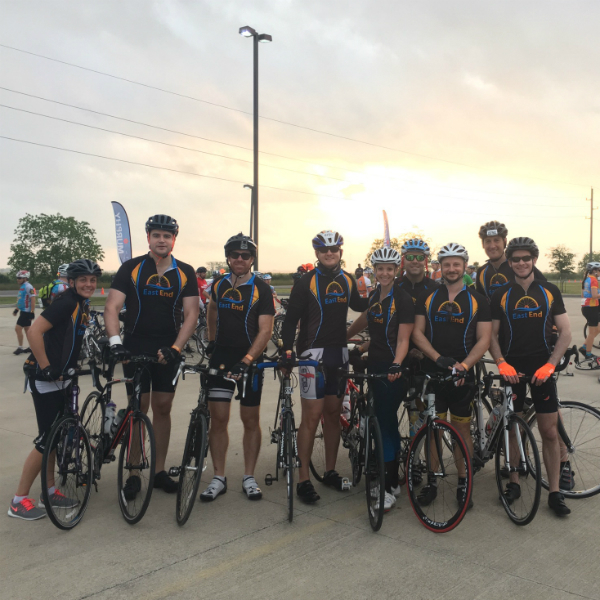 We organized our own team and planned a fun trip to Texas around the ride. I've been riding at SoulCycle for nearly five years, and I was confident that my rides with Laurie, String and Janet would prepare me for this ride — so confident, in fact, that I did not get on an actual road bike until the race. I was able to wear the same clip-in shoes that I do for SOUL, so figured it wouldn't be much different. I was mostly right — though next year, I will invest in some padded shorts! The first two legs of the rides were relatively flat and I was able to keep pace with my team (which consisted of another fierce female and seven very intense, tall men) without a problem. Everything changed when we started the third portion of the ride. It was all hills -— some short and steep, others long and gradual. These hills were where I felt my SOUL training had prepared me best. I attacked each one, hearing String yell, "Knees up! Knees up!" or Laurie saying, "Ride your bike like you live your life!" and so I listened to them. During the hardest parts of the ride when I wanted to get off the bike and lie down with the cows we rode by (there are a LOT of farms in that part of Texas), I thought of my fellow riders, many of whom were riding with MS themselves, and I thought of all the SOUL mamas that inspire me weekly during class, and they kept me going. 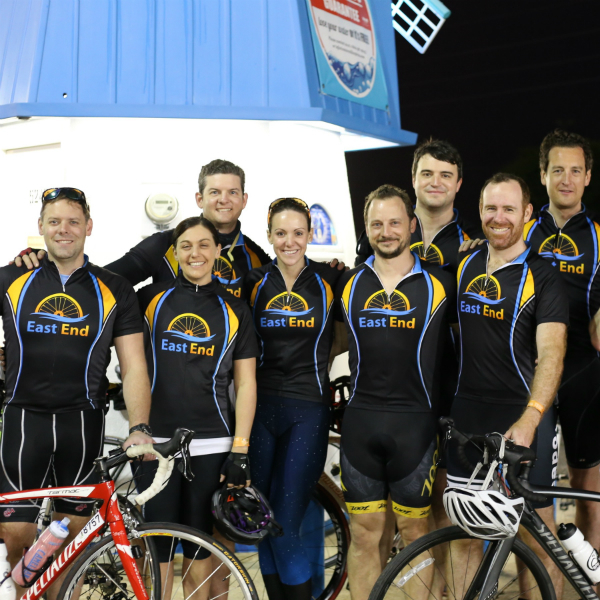 The ride was incredibly challenging at times and our team rode at a very competitive pace. I am so proud of our performance. I encourage any other SOUL riders who are looking to support those with potentially debilitating diseases to take on a fun physical challenge and do this ride. It was a blast! You can learn more about it here.